Sunday at one we started to arrive at Carrie’s sweet little house in Bellingham. 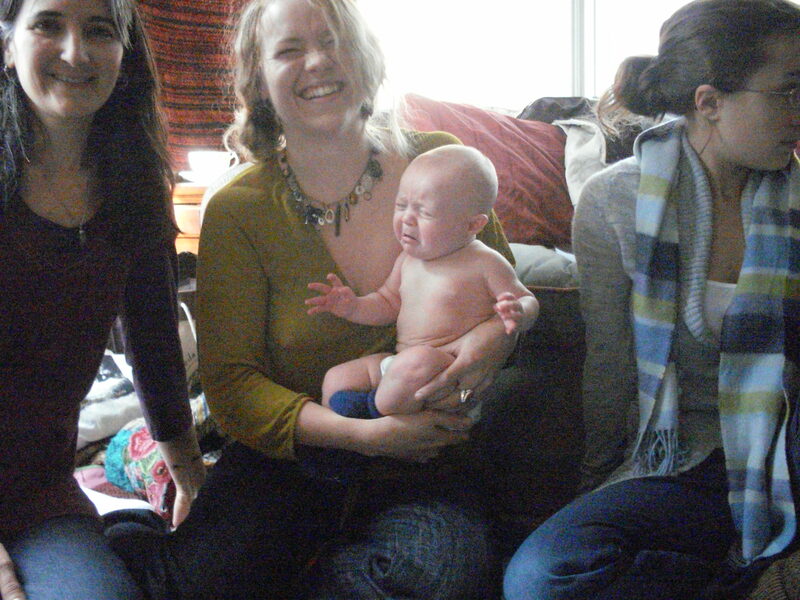 Coralie and I arrived first and Mishon made a surprise appearance coming all the way from Port Angeles. Michele from Living Earth Herbs, Hollie the Naturopath and her sister Corrie, who works doing human rights activism in war zones, were coming. Megan was going to be joining us for the last time before she left on her adventures in Thailand and beyond. 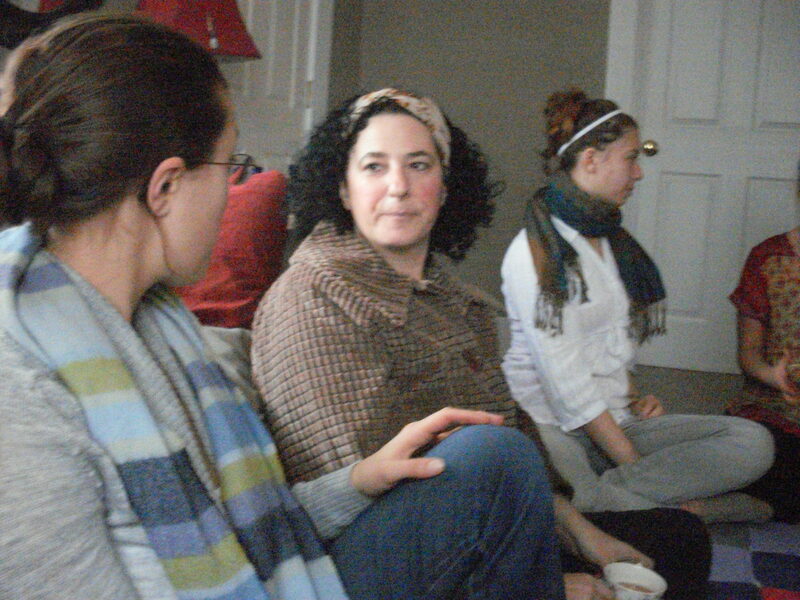 We were pleased that Suzanne, our dear teacher, was also able to join us this month. Whitney had returned from her travels through California and the SW and was bringing another friend from Lummi Island and was going to lead us in making a Love potion. 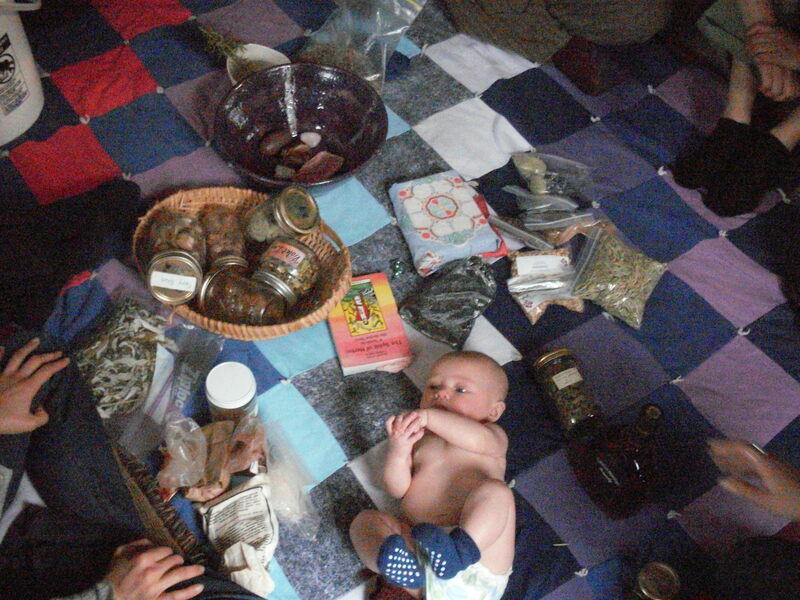 We all arrived with offerings for the pot : herbs, fruit, chocolate, mead, brandy, infused honey and precious stones. 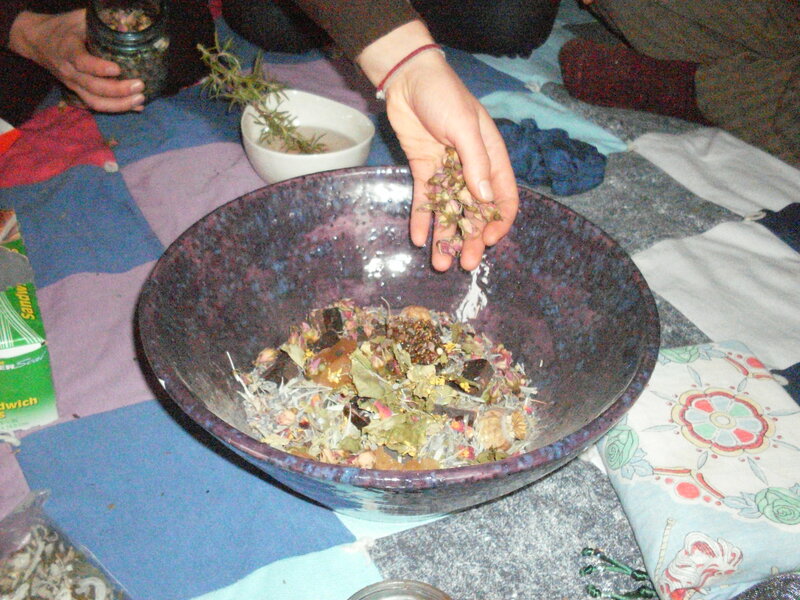 We gathered in a circle and began by smudging with salt water and rosemary. 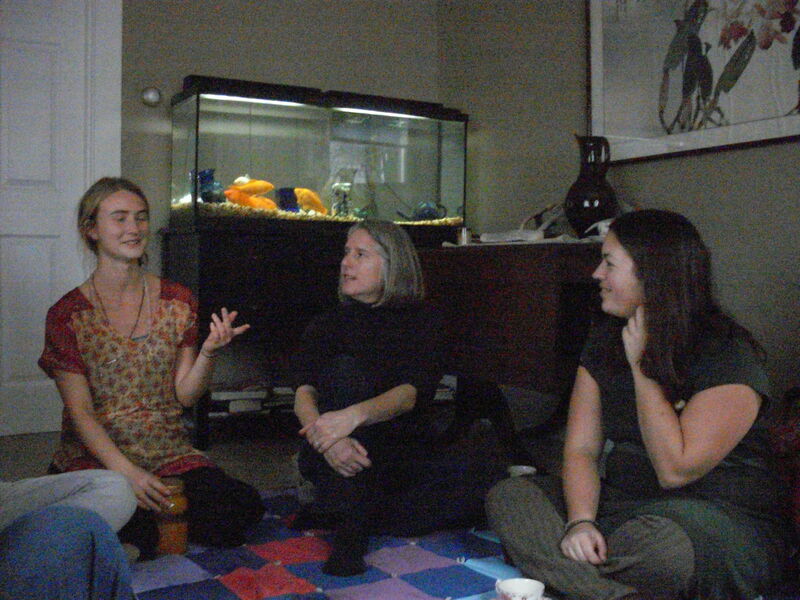 We took turns around the circle speaking the intention we had for gathering and what aspect of love we wanted to offer to the “potion.” Someone suggested we call in our grandmothers and around the room we called in our female ancestors. The next hour was spent with each of us offering our contributions to the pot with words of why and where they were gathered or in what way they exemplified love. 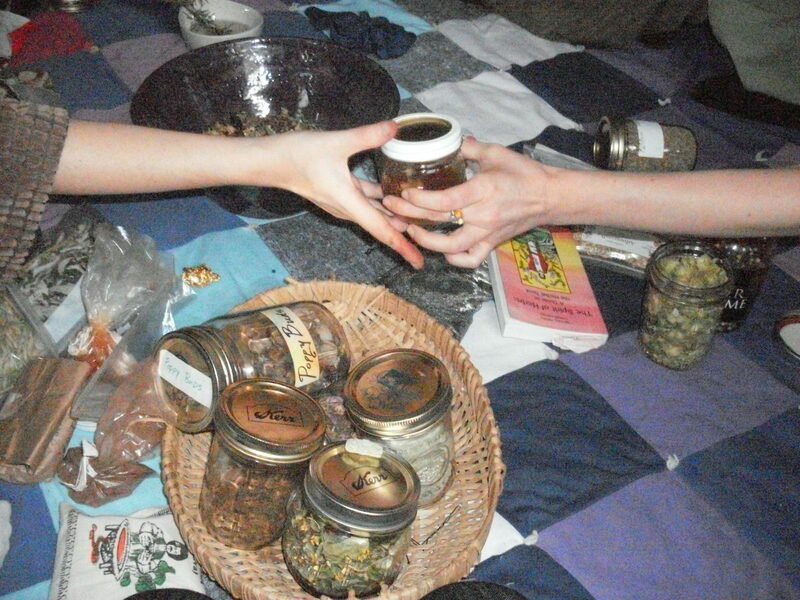 Mugwort, rose quartz, vanilla, poppy buds, tobacco,spoonfuls of herbal honey, cinnamon,violet, willow, kava kava, oranges, a lingam, a garnet geode from Lummi, cedar essence, roses, lots of roses, lavander, and many handfuls of damiana, various spices, and lots and lots of chocolate. I know there were more ingredients but those are all I can remember becuase our offerings were exercise in abundance; so many of so much and each representing a part of love. After so many loving plants and sweet additions were added to the bowl, we passed the brandy and mead and each of us poured it into the pot. I brought some Moxa that Ellen had made and because she was away for the gathering we burnt it in a shell gathered from the sound and let the smoke waft over the potion. We then passed it around the circle and smudged ourselves. 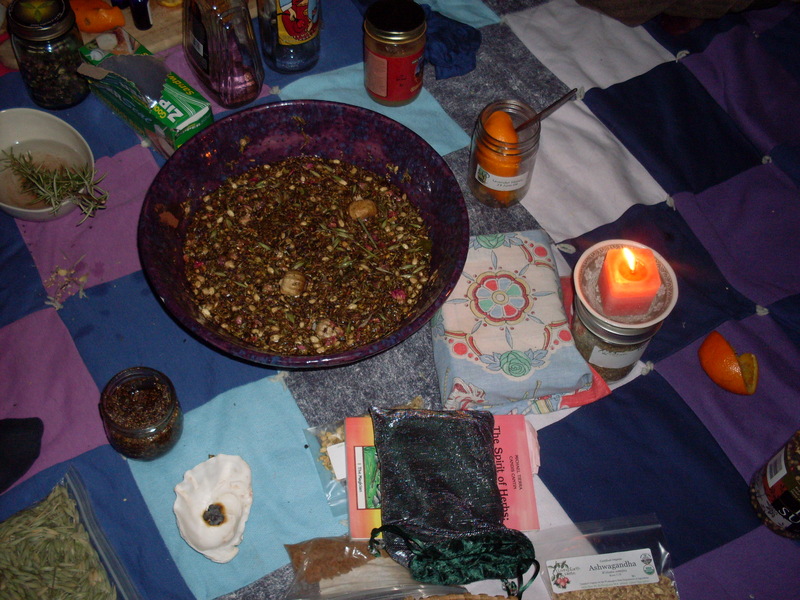 The smokey enchanting smell of mugwort overcame the room. We had not seen Whitney since August and we asked her about her travels and she gave detailed accounts of her experiences at the Grandmother’s Council in Sedona. We all asked Megan questions about her upcoming adventures. Happiness at having Whitney back was mingled with a certain sadness of losing Megan. As conversation settled we lit a candle and held hands and Michele led us in a few rounds of song about being medicine women. The potion was made two days past the new moon, it will sit and macerate for one moon and Whitney has brought the contents with her and she will meditate with it and daily send it loving thoughts and energy. One moon will be soon before Feb 14th so we hope to have our love potion ready by then. A physical representation of the love we all share, love of self, family love, romantic love, love for life, communication, nuzzling,love of the planet, indulgent love, love of magic and imagination, love of community, love of the feminine, love of the masculine, love of the divine, pampering, cuddling and swooning. We hope you might be inspired to make a potion of your own, there is always space for the creation of more love, lets us all commit to making it and sharing it alike. Thank goodness for all you sweet women in the world. I love all the little pieces of the ceremony. I spent half my day thinking about how to hit blunt objects with other blunt objects. I’m glad you are all hear to balance it out. Missing you and hoping to see you soon! Blessings to all my sisters……. i heard raves from people i didn’t even know……..no joke!! women on the sidewalk coming up and gushing on the mojo………spectacular!! We miss you too! Keep in touch the potion was LOVELY!